These Chanterelles are from Oregon. They are a mixed size. 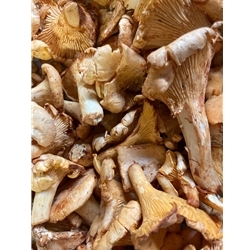 Due to where they are growing, your chanterelles will vary in moisture content, some are wetter if it rains on the coast, some are drier depending on if it is dry on the coast. We never know one day to the next what they are going to be. Usually starting mid November, the chanterelles are wet, there is nothing we can do to avoid this. Don't ever wash chanterelles because they absorb water really easily and will become water logged. Use a soft brush to clean the debris from your chanterelles. When they get bigger they are more brittle, which means they will break in transit, there is nothing we can do about that. Some will break but we do everything we can to minimize the breakage. Do not let your mushrooms sit out side, be sure to put them in the refrigerator as soon as they arrive. If the moisture content is high, wrap your chanterelles in paper towels and then in a hand towel so it soaks up the excess of moisture, the shelf life of chanterelles is 5 -7 days, check them every day because if one goes bad it will spread to the other mushrooms very quickly. You will know because they turn brown or get slimy, slimy is different than being wet. Also they may mold, it is very obvious if they start to mold, they will get black spots or green mold. Just make sure to throw that mushroom away. If you have any questions, please let us know via email and by telephone. Free Shipping for 10 or more pounds, choose in store pickup and we will deliver your order. Excellent quality, crisp not soggy, breaks with a slight snap, and the flavor is wonderful. Very good even without cooking them.